The mechanism of renal injuries is classified as blunt or penetrating. The distribution of blunt and penetrating injuries depends on the location ofthe reference center. In rural settings, blunt trauma can account for the largest percentage of renal injuries (90 % - 95 %) (Krieger et al. 1984). In urban settings, the percentage of penetrating injuries can increase to 18% (Sagalowsky et al. 1983) or higher. Blunt trauma is usually secondary to motor vehicle accidents, falls, vehicle-associated pedestrian accidents, contact sports, and assault. Traffic accidents are the major cause for almost half of blunt renal injuries (Kristjansson and Pedersen 1993; Danuser et al. 2001). In a 20-year review of renal injuries following free falls, Brandes et al. found a rate of 16.4% (Brandes et al. 1999b). Renal lacerations and renal vascular injuries make up only 10%-15% of all blunt renal injuries. 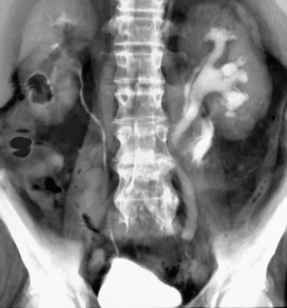 Isolated renal artery injury following blunt abdominal trauma is extremely rare and accounts for less than 0.1 % of all trauma patients (Bruce 2001). Schmidlin et al. (1998b)developed an experimental model to study force transmission and stress distribution of the injured kidney and developed a hypothesis that a bending mechanism maybe responsible for most blunt injuries. Maximum stress concentrations were caused by the combined effect of the applied force and the reaction generated by the liquid-filled inner renal compartment. Trauma to the injured kidney tends to concentrate at the renal periphery in this model, a finding that is often confirmed in explorations of severely damaged organs (Schmidlin et al. 1998b). Fig. 15.4.5. Low-velocity bullet gunshot injury thrombosis usually occurs in combination with arterial or parenchymal injury. Gunshot and stab wounds represent the most common causes of penetrating injuries. In most cases, they result from interpersonal violence. 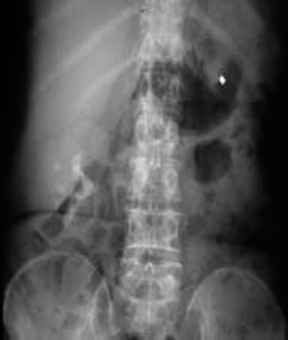 In penetrating inju ries, the retroperitoneum, and possibly the peritoneum itself, is violated depending on the path of the penetrating object. By definition, the latter leads to a nonsterile condition. In addition, the consequent bleeding and/or urine leakage that develops is an excellent media for bacterial growth. Renal injuries from penetrating trauma tend to be more severe and less predictable than those from blunt trauma (Fig. 15.4.4). 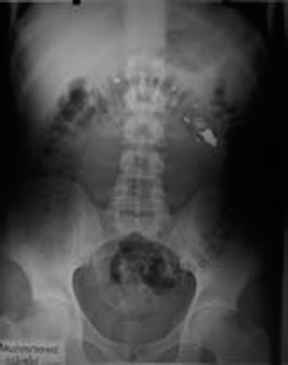 Bullets, because of their higher kinetic energy, have the potential for greater parenchymal destruction and are most often associated with multiple organ injuries (Ersay 1999). Renal injuries in recent wars are reported to be the commonest among urogenital organs. Most are found to be associated with major abdominal injuries and the rate of nephrectomies is relatively high (25%-33%) (Abu-Zidan et al. 1999; Tucak et al. 1995) (Fig. 15.4.5).